Tag line: "The craziest flight you'll ever take!" In the summer of 1980, my father took me and my brother to see Airplane! Five minutes in, we were all laughing so hard that we were crying. The jokes never let up, and by the time it was over, the three of us were exhausted. Airplane! was so funny, it plum wore us out! The first picture from the team of Jim Abrahams and brothers David and Jerry Zucker, the comedic minds behind such later films as Top Secret! and The Naked Gun, Airplane! is an hilarious spoof of the disaster genre. We follow former Army flying ace Ted Striker (Robert Hays) as he boards a plane to try and patch up his relationship with stewardess girlfriend, Elanie (Julie Hagerty). Ted, who was traumatized by the action he saw in the war, is now deathly afraid of flying, but when the flight crew passes out from food poisoning, he must take the controls and attempt to land the aircraft safely. Will his crippling fear work against him, or can Ted Striker conquer his phobias and become the hero of the day? A variety of well-known actors get their share of guffaws in Airplane! This was the movie that launched Leslie Nielson's second career in comedy, leading to a string of film and television roles that would carry him through the better part of two decades. Other Hollywood legends also make an appearance, including Peter Graves as Captain Oveur, the plane's somewhat confused pilot (when chatting with a young passenger visiting the cockpit, Captain Oveur asks the boy, among other inappropriate questions, if he watches movies about gladiators), Lloyd Bridges as a high-strung air traffic controller (“Looks like I picked the wrong week to quit amphetamines”) and Robert Stack as the hot-shot pilot who tries to talk the doomed craft down (“Flying a plane is just like riding a bicycle, only it’s a lot harder to put baseball cards in the spokes”). 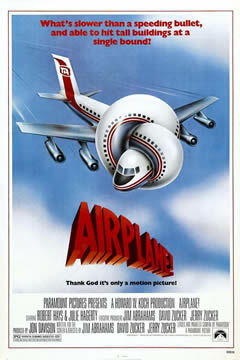 But as far as I'm concerned, the true comedic genius of Airplane! was a supporting character by the name of Johnny (Stephen Stucker), a less-than-helpful airport employee who plays practical jokes at the most inopportune times, and shows a real penchant for paper art. Airplane! was the first of its kind, a motion picture that paved the way for a number of imitators over the years (including its own inferior 1982 sequel, aptly titled Airplane II: The Sequel). For me, this movie will always represent a special moment from my youth, the wonderful memory of a comedy so unique it managed to keep me laughing. Absolutely one of the funniest movies ever! @Robert: I couldn't agree more! I agree that it's a very funny movie but first of its kind? What about The Big Bus? @MovieViewerFan: Good point! The Big Bus was 1st, and I thought that was also a very funny movie. So, yes, saying AIRPLANE was the 1st of its kind is incorrect. Still, it was AIRPLANE! that launched the imitators. From what I can gather, THE BIG BUS was a bit of a flop, and it wasn't until AIRPLANE! became a huge hit that we got the POLICE SQUAD! series, TOP SECRET, etc., etc. It's the same with slasher films. The original BLACK CHRISTMAS pre-dates John Carpenter's HALLOWEEN by several years, but it wasn't until HALLOWEEN lit up the box office that we started getting the imitators. BLACK CHRISTMAS, while a tremendous movie, didn't pull in a lot of money. It should be noted that Airplane! wasn't the first movie from the ZAZ team, The Kentucky Fried Movie was. If you haven't seen it you should check it out, it's hilarious. Airplane is a riot! So much so, that I'm surprised you haven't yet included Airport, the movie satirized to a large degree by Airplane, on your list of reviews. Hillarious comedy. From the brilliant opening parody of jaws to the end (wait until the credits are over) the laughs never let up. A must. The movie satirized in Airplane to a large degree is Zero Hour.